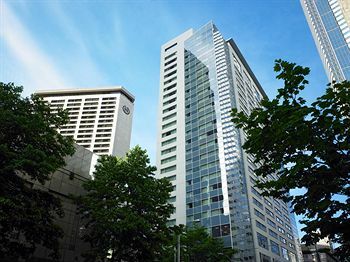 The Conference will be held at the Sheraton Seattle Hotel at 1400 6th Avenue downtown, within walking distance of dozens of restaurants, shopping, cultural attractions and entertainment. It is a smoke-free and pet-friendly hotel, providing pet amenities like a dog bed, food bowls and water bowls for pets. Special rates are available for Conference attendees. Shown below are rates for one or two people, rooms with one king or two double beds. Extra person charge is $25, but children under 17 stay for free with an adult. Room rates are subject to state and local taxes, currently 15.6% plus $2.00 per room, per night, and state or local mandated taxes or assessments. All rooms reserved under the Conference rates will have complimentary Internet access (If you see a note saying there is an added fee for Internet service, please ignore it). All hotel guests have complimentary access to the hotel fitness center and pool. Hotel guests with disabilities should communicate their needs directly to the hotel as soon as possible after they reserve their room. The hotel has 11 ADA-compliant guest rooms. Check-in time is 3:00 p.m. Check-out time is noon. After you register for the Conference, your confirmation e-mail will include a link to the IAJGS page in the Sheraton Seattle’s reservation system. Conference discount rates are available only for registered attendees and only by using this special link. You also will find the link by logging in to the Conference Attendee Service Center. That link is in the REGISTRATION menu on our Internet site, http://www.iajgs2016.org. You will need your Conference password from the confirmation e-mail to log in. To reserve a standard or upgraded room: Use the special link on your confirmation e-mail or the link in the Conference Attendee Service Center. To reserve a suite: Check for availability and book a suite directly with the hotel by calling a reservations agent at 888-627-7056. Be sure to mention you are attending the IAJGS conference; you’ll need your Conference registration code from the confirmation e-mail. Guest rooms have small refrigerators. You can remove the contents (mini-bar and snack items) without a charge only if you replace them unopened. On request, the hotel will remove the contents from the mini bar prior to check-in. Please contact the hotel directly for this service, which may carry a fee. A very limited number of additional refrigerators are $10 per night, if available. Rollaway beds are $20 per night and are allowed only in King rooms because of fire codes. A limited number of microwave ovens are available at $10 per night. The special rate covers arrivals as early as Wednesday, August 3, 2016, and departures as late as Sunday, August 14, 2016, as long as there are rooms remaining in our room block. The cut-off date for reserving rooms in the room block is 5:00 p.m. PDT on Friday, July 15, 2016. After the cut-off date, or after all the rooms in our block have been reserved, whichever comes first, it will be at the hotel’s discretion whether to accept additional reservations, which may be at the prevailing rates (not the special Conference rates). Valet parking at the Sheraton Seattle is $52 per night. Self-parking is $30 per day, with up to three exits per day. The hotel does not have a Conference rate for parking, and a parking spot is not included in the room rate. Some nearby parking lots are less expensive. Try http://www.bestparking.com and search for Seattle “Retail Core” to locate them and see their rates. Street parking (if available) is $4 per hour Monday through Saturday, free on Sunday. The hotel allows cancellation with no charge up to 6 p.m. on the day before one’s scheduled arrival. Otherwise, the cancellation fee of one night at the room rate plus tax will be charged. Because we have a limited number of rooms, we ask that you release your reservation as soon as you know you will not be attending the Conference, so another attendee can get a room. If you need to check out of the hotel before your confirmed check-out date, you must inform the hotel when you check in to avoid an early departure fee of $75. For general information about the hotel, visit the hotel’s Internet site.